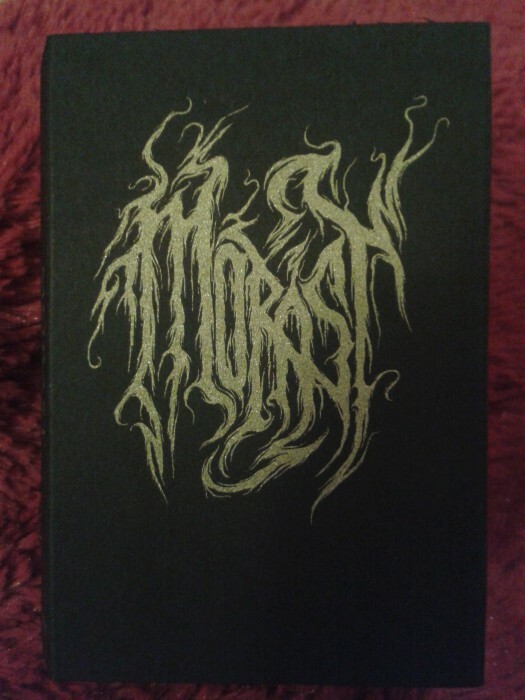 Morast is a pretty young four piece band from NRW/Germany. They introduce themselves with a demo of four songs of blackened death doom with an overall playing time of about 26 minutes. It's dark and evil, heavy and downtuned, like this kind of music ought to be. Unusual though, for this kind of music is the bracingly clear production, which brings a powerful depth to the sound and supports the thick atmosphere and groove rather with crisp drums and bouncy strings than with blurriness. The riffs, most times, are going more into a midtempo direction than being really slow, still there's a sense of slowness due to their dragging and depressing heavyness. Occasional black metal outbursts and touches of dissonance provide momentum and enhance the already bleak atmosphere. The vocal style ranges somewhere between bellowed and almost spoken, even whispered, but are always dark and menacing. The four songs, of which the first three have a length of about six minutes, the last one is eight minutes long, share an overall atmosphere of a depressing, bleak darkness, but they all have their own focus in mood. While the first song "Purging" turns from a brooding doom vibe into some blistering black metal ferocity, the second one "Error" has the most overall doomy feel, with a great sense for dramatic twist. The third "Alleingang" sports the most dissonant tunes to create a spine-tingling eeriness, and the last and longest one "The Cold Side of Bliss" with its dynamic and propelling drumwork adds an almost hypnotizing, psychedelic mood. This demo is a very convincing debut release, which really leaves you wanting for more of this Black 'n' Doom groove.